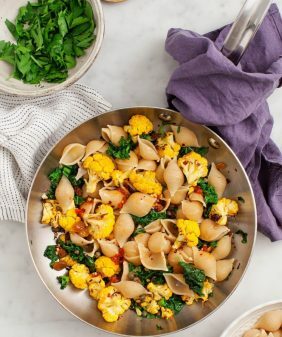 This healthy weeknight dinner uses half butternut squash noodles and half pasta to create a delicious vegetarian meal. Walnuts, fried sage, leeks & lemon add flavor & texture to this cold-weather dish! 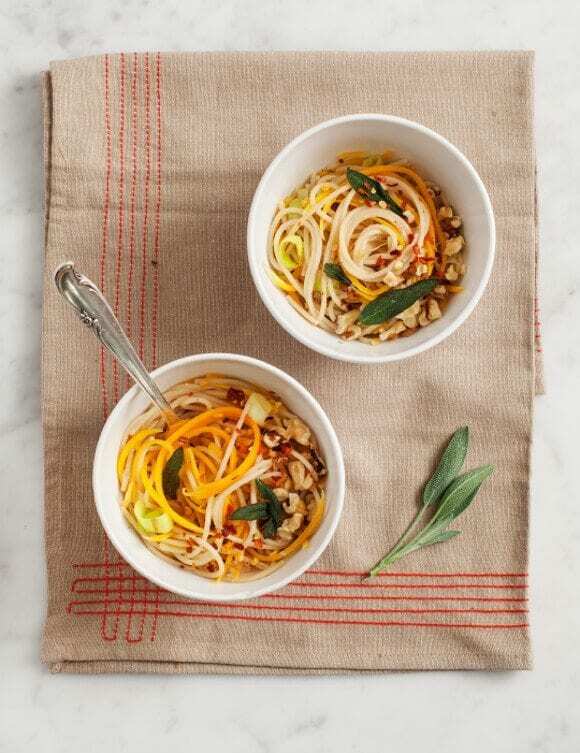 Get excited, it’s fall faux noodle time! In the past we’ve done papaya, zucchini, and cucumber, but today we’re making butternut squash noodles. I mixed these pretty orange julienned spirals with regular noodles and made this simple leek & sage pasta. 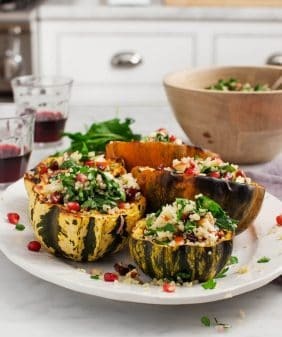 Of course, you could make this same dish with cubed squash, but you can’t twirl cubes on your fork, so where’s the fun in that? The butternut squash noodles make for a fun texture variation – I cooked them for less time than the pasta noodles, so they had nice firm bite. I topped it all with walnuts, fried sage, and chile flakes. The squash is little bit more difficult to get through than a cucumber, but it was easy once I figured out this little trick. Slice your squash lengthwise in half (scrape out the seeds), and then slice the half (lengthwise again) into 5 or 6 thinner wedge-shaped strips that are closer in width to your peeler (an inch and a half or so). Push your julienne peeler over each wedge, and voilà… butternut squash noodles… and a *bonus* arm workout. (I have this julienne peeler). 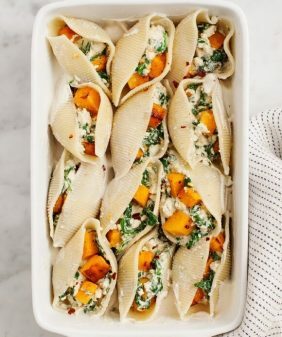 This healthy pasta dish made with half butternut squash noodles is a comforting vegetarian dinner. Vegan & gluten-free options. First, fry the sage. In a large skillet, add enough oil to well coat the bottom. Once the oil is hot and shimmering, test-fry 1 sage leaf. In a few seconds it should turn deeper green, remove and drain on a paper towel, it should become crispy as it dries. If it burns turn your heat down and test another. (I put 10 leaves in the recipe so you can mess up a few). Once your oil is at the right temp, fry them all. Drain and set aside. Turn off the heat and let the pan cool for a few minutes, then pour out excess oil, leaving just enough to continue to cook with. Boil pasta in salty water for 8 minutes, or until al-dente. In the last 2 minutes, add the butternut squash spirals. Meanwhile, turn your large skillet back up to medium heat. Add the leeks and a few pinches of salt & pepper. Cook until soft and translucent, then add the minced garlic. 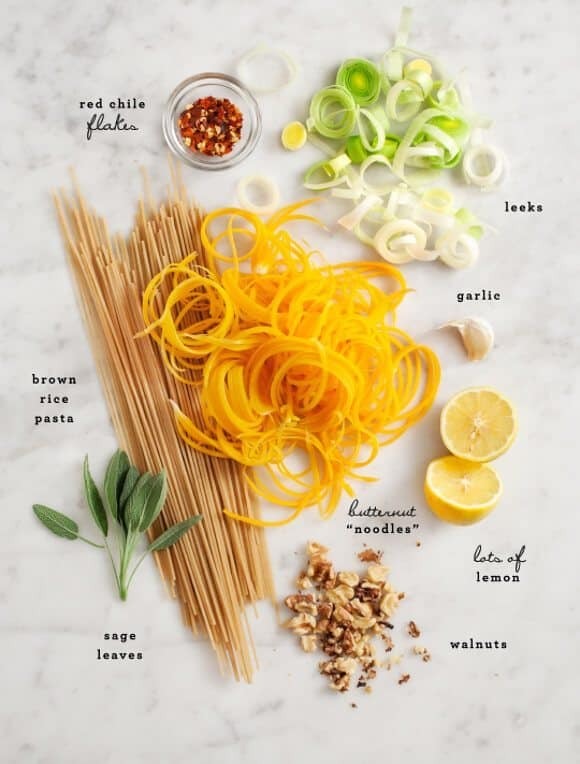 When your pasta & butternut noodles are ready, drain and add them to the skillet, reserving ¼ to ½ cup of the starchy pasta water for later. Add a few squeezes of lemon, a pat of butter, and a few good pinches of salt, pepper, and red chile flakes. Toss everything together to coat. Add pasta water, ¼ cup at a time if necessary to loosen the pasta. Once the butternut noodles are tender but still have a firm bite, turn the heat off (you don't want mushy butternut squash). Taste and adjust seasonings, then transfer the pasta to a serving platter or bowls. Top with chopped walnuts and fried sage leaves. Serve with grated pecorino and/or balsamic vinegar, if you like. Beautiful recipe. I just ordered a spiral cutter and cannot wait to make more “veggie” noodles! you’ll love them, they’re so fun! Also, so pretty & fresh! Lemon, butter, chili flakes, sage, and butternut squash work so well together. I just added that peeler to my cart on Amazon. I totally need one! 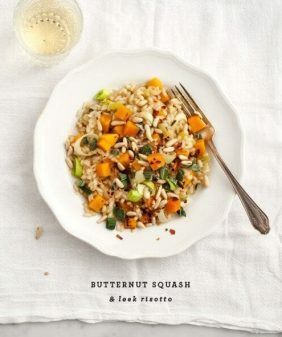 Love the sound of this pasta – I really like that you made the butternut squash into noodles too for an extra dimension of texture. The flavours in this are so great too. Gorgeous! I just got into making ‘faux noodles’ and I’m pretty much hooked. Great idea! 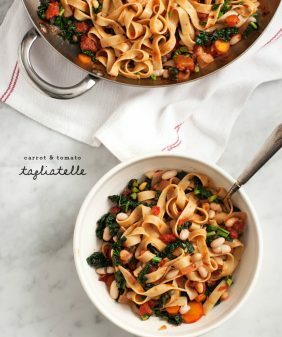 Your pictures are so tempting that i have to try this pasta for dinner:) Love your blog and photography! Oh my gosh, how have I never thought to run butternut squash through my spiralizer!?! It might be a bit too firm but I’m totally going to try now that you’ve planted the idea in my head. These photos are beautiful! thanks! It is a bit firm, I didn’t try it in the spirilazer, let me know if that works for you (or if it doesn’t!). Butternut, chili and sage are such a great combo! I love the sound (and look!!) of this! Perfect dinner in my mind! I know, probably my 3 favorite fall ingredients! what a unique take on pasta! i make wheat pasta with spinach, walnuts, goat cheese, and butternut squash cubes all the time but never thought to shave it to create “noodles.” delicious! i need a peeler STAT. a very worthwhile purchase, I use mine all the time! This sounds delicious! Can’t wait to try it out on my Italian family! This might the prettiest veggie noodle dish ever. That color!! And it sounds delicious too! Gorgeous orange noodles! 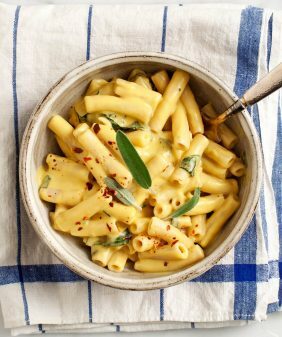 I love the combination of squash, sage and walnuts, so I’d love to try it in its pasta form. I made this dish last night. It was great. However, the final product does not look as pretty as yours. The butternut “noodles” broke up in the final step in the pan. Maybe they were in for too long? Still tasty anyway. I love your blog and would like to move in with you guys. (I can take care of your dog.) Thanks for posting such wonderful recipes and being so awe-inspiring. Hi Coco, ha, thanks! I cooked mine for a pretty short time in the pan, in the end they still had a good bite (even bordering on undercooked). But I’ll try to time those steps better next time. Or maybe yours were a bit thinner than mine, you could probably skip boiling them in water first. 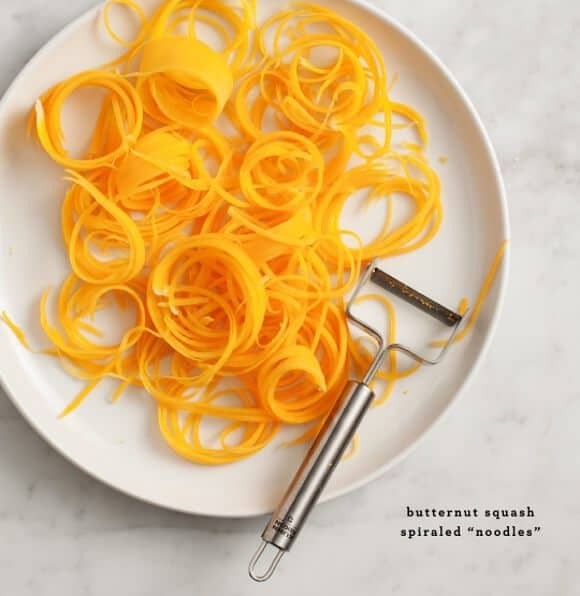 Love the idea of running the butternut squash through a spiralizer! Your recipes and pictures are ABSOLUTELY beautiful and inspiring! The dish is new to me. I haven’t tried a noodle dish with squash on it. Looking forward to trying it since I love noodles of any form.